We invite you in 2017 to join Marshall Vian Summers, The Society and others from around the world in a campaign to bring Greater Community awareness and education worldwide. Our world must learn that humanity is emerging into a Greater Community of intelligent life in the universe. Our world must learn about the Intervention that is taking place. The new book of Revelation The Greater Community presents the perfect opportunity to raise this awareness and education. • Alert people everywhere to the Intervention that is occurring from beyond the world. • Provide a Greater Community awareness, education and perspective to the human family. • Make available the preparation for our future into the Greater Community. As millions of people look up to the sky to witness the total solar eclipse on August 21st, experiencing the wonder of our world’s relationship to our sun and to our solar system, a book of Revelation on humanity’s relationship to the Greater Community of worlds is being released. We need your help to bring the education and awareness of the Greater Community to as many people as possible. Make this book of Revelation available free online – both the text and original audio Voice will be available here once published. Offer the print book at cost — $5/book for three or more books. The book is ready for pre-order at the New Knowledge Library Store. Offer The Greater Community audiobook for free on iTunes, Spotify, New Knowledge Library and at newmessage.org. Everyone will have access to the original spoken audio for all the chapters of The Greater Community book. Bring the Voice of Revelation to video. The Society is currently working to publish the Voice of Revelation into video form and to share this with as many people on as many platforms as possible. Share teachings from Marshall Vian Summers and The Greater Community in text, images and video on Facebook and Youtube and other platforms, and promote these to new viewers. Translate The Greater Community into 20 languages. 35 translators have already stepped forward to support the translation of this book, and translations have already begun in 16 languages. Film a new series of teachings by Marshall Vian Summers on the reality of humanity’s contact with intelligent life and make these available free on YouTube.com. Important! Students of the Free School, supporters of the Kickstarter and donors to this campaign will receive an email with the full text of the book weeks before it is published to the world on August 21. We will be actively updating this page as things progress. Please continue to check back over the next few weeks and months for further updates. Make a monthly contribution to the New Message and join the worldwide community of givers who financially support The Society in its mission to bring the New Message from God to humanity. Your monthly contribution will both advance The Greater Community campaign, and also provide critical support for the many other endeavors and projects underway now to make the New Message available to people everywhere. The Society launched a Kickstarter Project in order to reach new people and express the value this book has for humanity and each individual. Your participation in the Kickstarter project will help increase the attention the book receives on Kickstarter and around the web (don’t forget to voice your experience and leave a comment). We would like to express that the financial needs of the Greater Community campaign are not limited to the goal of $8000 as noted on Kickstarter. We are working within the requirements of the Kickstarter environment and have to keep our fundraising goals attainable and realistic. Our goal for the entire campaign (raised on or off Kickstarter) is $16,000. This will enable the level of outreach, education, publishing and translation that the Society envisions undertaking to bring this book to people around the world within a limited span of time. Please choose to give at any amount through this campaign page, on Kickstarter.com and especially to give monthly as pillar or a friend of the New Message to support the full work of bringing the New Message from God to the world. We thank you for giving in any way and at any amount towards this important campaign. Share The Greater Community book page and online chapters on Facebook, Twitter, YouTube, Reddit, Online Discussion Forums, your blog or website and anywhere else online where people are interested in the topic of UFOs, Contact and life in the universe. When posting on social media, use this special link to The Greater Community book page: goo.gl/YsE8rB and everyone can track the results of how many people visit the page, where they’re from and how they got there. Make a one-time donation to The Greater Community campaign to help reach hundreds of thousands of people with the truth, mystery and revelation contained in The Greater Community. Using the power of the global internet, a donation of just $100 allows The Society to directly present The Greater Community to thousands of people. This is an unparalleled time in the history of the world, when billions of people are online, reachable and searching for a new experience and awareness in their lives. With your help in the months ahead, the teaching and the preparation contained in The Greater Community will be able to reach more of those people who are truly looking for this. Share The Greater Community book with others. Take the book into the world with you and strike up a conversation with someone. Leave a copy of the book out in the world where others who would value this message can find it. Send a copy to friends or family who would be interested. However you see to share the print book, please do so. 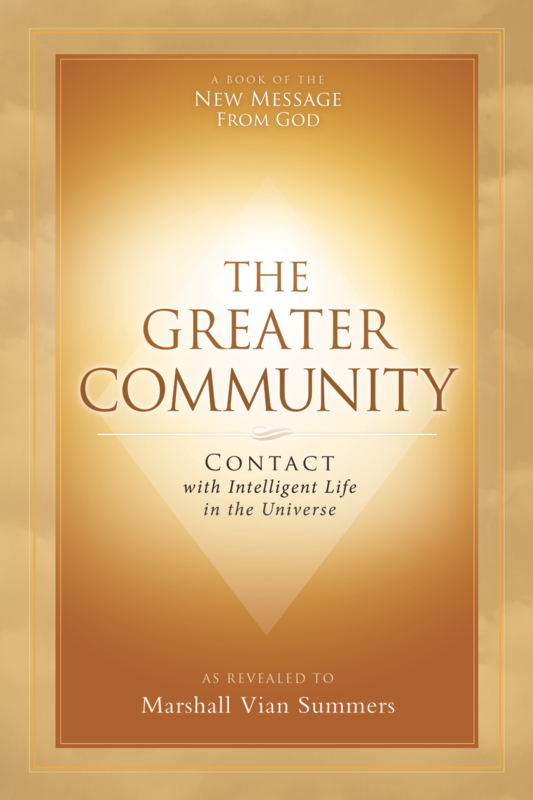 The Greater Community can be pre-ordered at cost for $5/book here. Write a review when the book is available. Please leave a review of the book on as many online retailers as possible, for example Amazon.com, Barnesandnoble.com and iTunes (links forthcoming). Share your experience of this book and it’s message for the world by commenting on news articles regarding UFO’s, extraterrestrial contact and life in the universe. In the weeks ahead, The Society will be releasing videos, photos and text selections from The Greater Community on YouTube, Facebook, Twitter and elsewhere. Re-share what The Society releases and add your own experience to the communication, either through an original post or a comment. Other Ideas? Share them with us! The Greater Community with the world. Over the Summer of 2017, the Free School of the New Message will be centered on the new book of Revelation The Greater Community. We invite you to study this new Revelation with others from around the globe. Register for the Free School and then visit the current study plan and join over a hundred people on the weekly Campfire chat every Saturday.